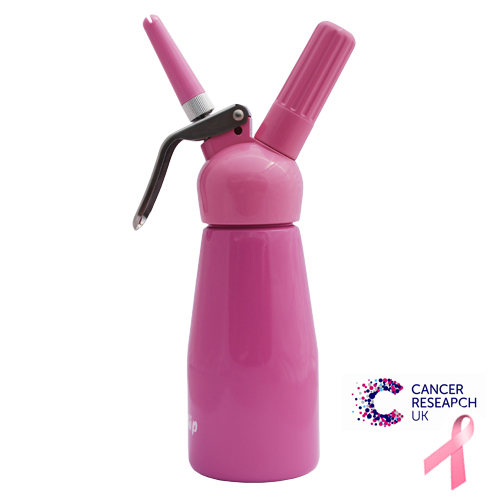 This small 0.25L cream whipper is now available in bright pink with pink plastic parts. It is ideal for regular home use and for smaller catering events. 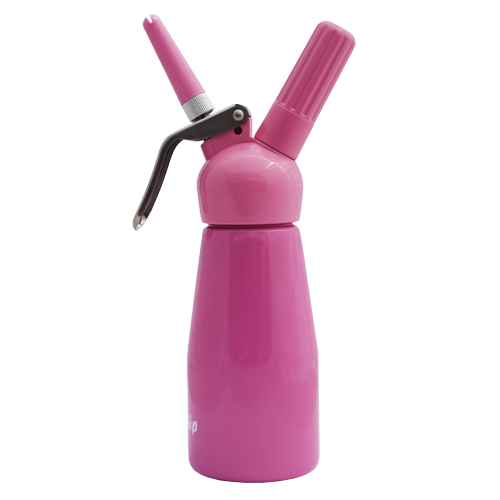 Its small size makes it convenient for topping hot drinks, desserts and milkshakes. Despite its compact size, this whipped cream dispenser will make up to 0.75 Litres of freshly whipped cream with just the pull of a trigger when used with a single 8g cream charger. Nitrous oxide acts as a natural preservative and will keep your whipped cream fresh inside the whipper for up to 10 days if stored in a refrigerator. Please note that this ¼ litre whipped cream dispenser is not suitable for heavy, commercial use and is only suitable for use with cold ingredients. If you require a whipper for professional use and intend on using hot ingredients to make foams and espumas you will need to purchase a stainless steel whipper. Cream chargers NOT included, please purchase these separately.